PITTSBURGH (CNS) — The new evangelization is not a new Gospel, but refocuses the faithful on the good news of Jesus and involves the renewal of faith and the willingness to share it, Cardinal Donald W. Wuerl of Washington told the National Catholic Education Association. 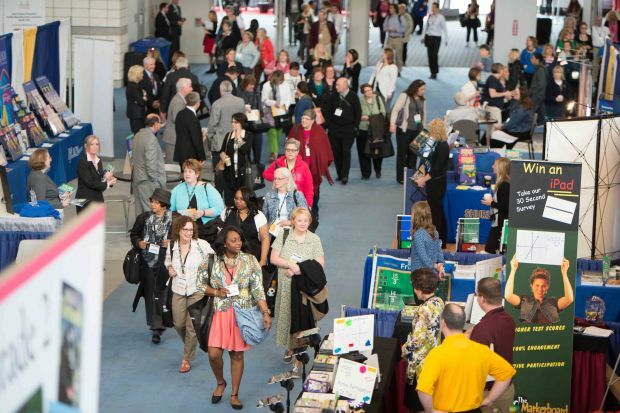 Hosted by the Diocese of Pittsburgh in partnership with the NCEA, Catholic Library Association and the National Association of Parish and Catechetical Directors, the convention drew about 6,000 participants during its April 22-24 run at the David L. Lawrence Convention Center. Representatives from across Catholic education attended, including staff from elementary and secondary schools, religious education programs, seminaries, and colleges and universities. Cardinal Wuerl, a native son and former bishop of Pittsburgh, presented his remarks in light of Pope Francis’ apostolic exhortation, “The Joy of the Gospel” (“Evangelii Gaudium”) and the pontiff’s call for a new evangelization within the church and around the world. In the exhortation, the cardinal noted, the pope invites people to focus on the blessing that is the love of God in their lives. “His energy is a bright ray breaking through the secular darkness,” Cardinal Wuerl added. While the church is the home of the new evangelization, he said, Catholic education is an instrument of it. The cardinal explained that it can involve “ordinary” areas of evangelization, something as simple as teaching a child the sign of the cross and that it can focus on outreach to those who have fallen away from the church. Cardinal Wuerl related the story of an individual who had questioned him on the importance of religion. He said he responded by asking what the world would be like without the values of religion. How much harsher would it be if there was nothing for people to answer to, to teach them to have trust in others, he said he asked the person. “The church brings to our world today an invitation to faith, an encounter with the Lord Jesus and a whole way of living,” he said. But the secular world is often overwhelming, Cardinal Wuerl noted, and many markers of the faith have been taken away. He expressed concern that secularism has also diminished appreciation of the faith. Today the church is the only living witness to Jesus, Cardinal Wuerl said, pointing to the 2,000-year unbroken line of the faith being passed on through faithful people. “It’s in that context that you and I can stand firm in our faith,” he said. Passing on the faith highlights the importance of Catholic schools and religious education programs, he said, explaining that if the new evangelization is to be successful, children must be firmly grounded in an authentic faith. Only then will children be able to live their faith and daily existence with Christ, he added. Expressing his belief that Catholic education must present a real vision of what it means to be created in the image and likeness of God, Cardinal Wuerl said the authentic proclamation of Christ begins with a clear declaration of who he is. The faithful, he noted, must understand how essential the church is in their lives. The work of building the kingdom as just the beginning, he said. Cardinal Wuerl said that evangelization involves the work of disciples who share the good news. It involves a bold new courage, a connectedness to the church and a sense of urgency that reminds people it is their time to pass on the message of Jesus. “Our message should be one that inspires people to follow us,” he said. Christian Brother Robert Bimonte, NCEA president, said the convention was a celebration of Catholic education and the extraordinary people who make it happen. “In the ‘city of bridges’ we celebrate the bridges you build each and every day,” he told the gathering. In introducing Cardinal Wuerl, Bishop David A. Zubik said that since Father Denis Baron celebrated the first Mass in Pittsburgh in 1754, Catholic education has been a passion and a force for the church of Pittsburgh. Today more than ever, he said, the world needs Catholic education and the witness of people who are created in the image and likeness of God. Franko is a staff writer for the Pittsburgh Catholic Review, newspaper of the Diocese of Pittsburgh.